Figuring out if you are pregnant is not always an easy thing to do. If you are not planning a pregnancy you may be worried and scared. These feelings are normal. It is important to remember that having one or more of these signs does not necessarily mean you are pregnant. There may be other reasons why you are experiencing these things. If you think you have one or more of these signs it may be helpful to go and see your local doctor. Check out Reachout's Finding Help section for more information about how they can help you. What can you do if you think you are pregnant? Taking the step to test if you are pregnant may be difficult. However, knowing the answer may allow you to move forward in deciding what to do next. Having support from a friend or someone you trust may be helpful while you are working out if you are pregnant. Home pregnancy tests are available from most chemists. Home pregnancy tests are not 100% accurate so it is a good idea to go and see your local doctor if you are still unsure. A positive result is more likely to be correct than a negative one. Your local doctor or a family planning centre/clinic will be able to let you know if you are pregnant. They also are able to talk to you about the best ways to look after yourself during the pregnancy. If you are unsure about what to do if you are pregnant they may also be helpful people to talk to about your options. Your local phone book or yellow pages should list the doctors and family planning centre/clinic in your area. Thanks to Reach Out who prepared this fact sheet. They have a great site to visit for more information: www.reachout.com.au. Other things on Reach Out to have a look at are Reach Out Central (ROC); a new interactive space, and the community forum; where you can talk about stuff and find support on dealing with a range of issues. 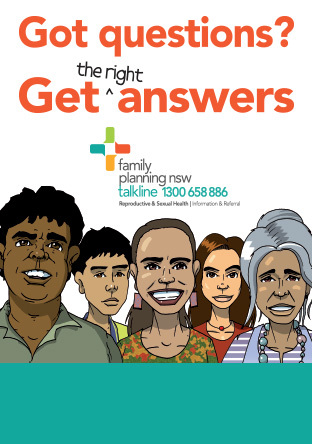 Contact the FPNSW Talkline on 1300 658 886 (Mon - Fri 9am - 5pm EST) or via email.